Nearly a year ago, Volatility became the first (and to this date, the only) memory forensics framework to analyze kernel timers for malware analysis. The timers plugin was introduced in two of my older blog posts: ZeroAccess, Volatility, and Kernel Timers and Ain't Nuthin But a K(Timer) Thing Baby! Today's MoVP introduces yet another new feature exclusive to Volatility that involves a different type of timer - GDI Timers. These timers can be set from user mode GUI applications and associated with a callback function that executes when the time elapses. As you'll see in this post, malware often uses these timers to schedule routine downloads, make sure processes stay hidden, and various other tasks that require constant or routine attention. The Windows API function SetTimer can be used by GUI applications to receive notification when a specified time elapses. When the timer expires, the system either calls an application-defined callback function (if one is provided as the lpTimerFunc argument) or it posts a WM_TIMER message to the application’s queue. The queue handler would then process the WM_TIMER message and perform the desired action. From a forensic standpoint, timers are useful because they’re often used in place of simple while loops that use Sleep to perform actions at regular intervals. The difference is that SetTimer leaves obvious artifacts in GUI memory and while loops do not. Specifically, by analyzing timers, you can identify the process ID and thread ID that set the timer, the rate (initial time-out value in milliseconds), the countdown (milliseconds left before the timer expires), the window associated with the timer, and the address of the callback function. nID is the unique ID assigned to the timer (returned by SetTimer). cmsRate is the initial time-out value, in milliseconds. The uElapse argument to SetTimer is copied into this field. pfn is a pointer to the callback function (the lpTimerFunc argument to SetTimer). You can disassemble this address to determine what happens when a timer expires. GDI Timers are USER objects, so we can iterate through the USER handle table and capture TYPE_TYPER. 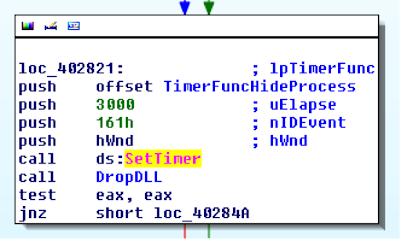 The figure below shows a disassembly of malware setting a timer with ID 161h. As a result, the system will call TimerFuncHideProcess every 3 seconds. The objective is to continuously check and make sure one of the malware’s processes stays hidden. 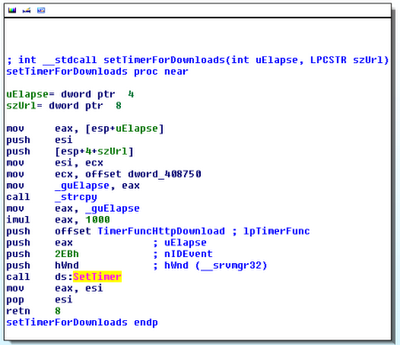 In the next example, the image shows the same malware using SetTimer with ID 2EBh. The purpose of this one is to ensure the function TimerFuncHttpDownload is executed every uElapse seconds (passed as an argument, so it can vary). The callback function contacts the malware’s command and control server, so it makes sense that the attackers would want to do it more than once – in case the server is offline during the first attempt. 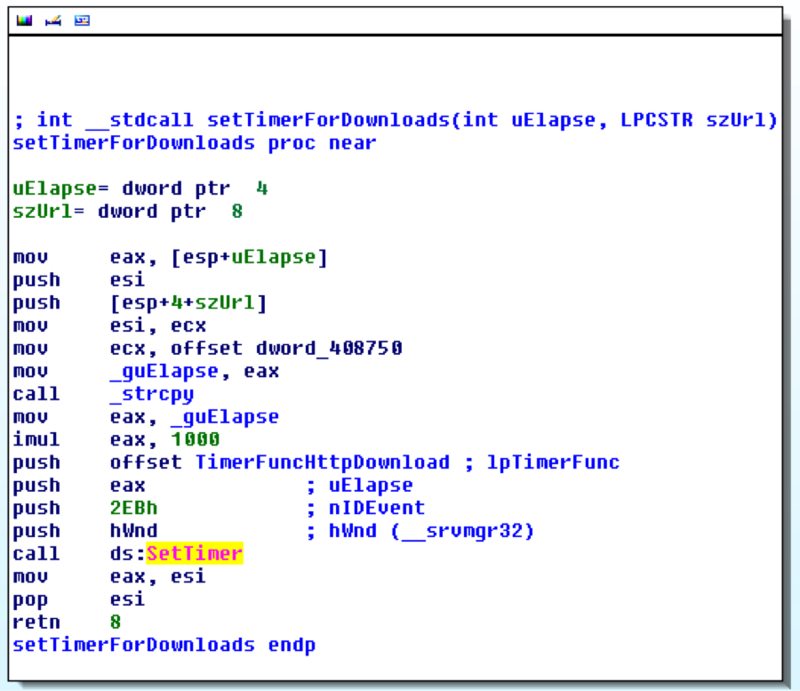 Analysts can detect these artifacts using the gditimers plugin (not to be confused with the original timers plugin, which explores kernel/executive timers). In the output below, two timers should immediately draw your attention: IDs 2EBh and 161h – because that’s what we saw in the IDA disassembly. You might also notice from the plugin’s output that for ID 161h, there are 1578 milliseconds left until the next time the function at 0x004010aa executes. Interestingly, there are not only several legitimate timers set by explorer.exe and csrss.exe, but KernelDrv.exe (another Laqma component) also sets timers. For what purpose? That’s when you disassemble code at the specified TimerFunc callback and figure out. More information on the gditimers plugin and its usages in forensic investigations will be presented at Open Memory Forensics Workshop (OMFW) 2012.